Maybe it’s something about the recorded-to-tape nostalgia, and the yacht rock-indebted rhythmic synths, or the impossibly tousled wisps of mullets (both male and female); but the internet sank its teeth into a now-defunct Winter Olympics event this week: ski ballet. And it makes sense. When you see footage of actual ski ballet competitions from years past it’s hard to deny the novelty of it all, while simultaneously taking in the raw athleticism and artistry of the event. There’s also an extremely “What the hell am I watching?” quality to ski ballet. In short, ski ballet is a combination of figure skating and skiing. Skiers would mix dance elements with jumps similar to figure skating, with the addition of vault-style tricks using elongated ski poles (they would also wear shorter skis for easier mobility). The sport was popularized in the late ‘70s, through the ‘80s, and into the ‘90s, finally reaching its official demise in 2000. But really, no words can truly do it justice. 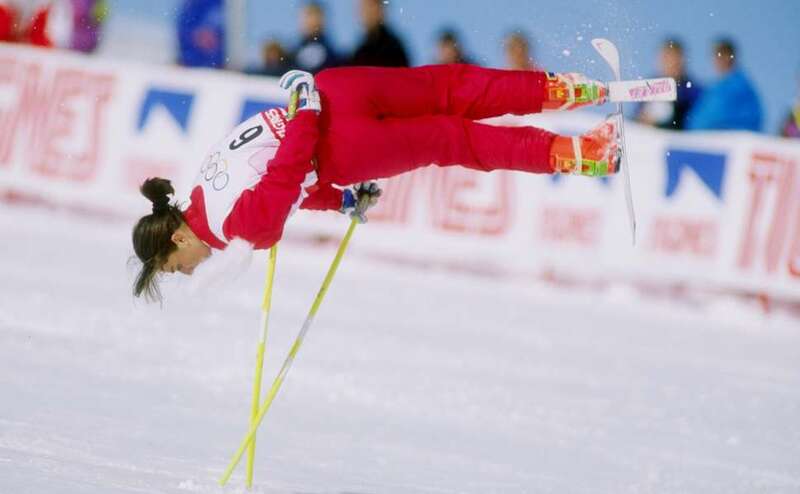 Ski ballet was never an official Olympic event, yet it was featured in the 1988 and 1992 games as a demonstration sport. The fact that it never became an official event is surprising when looking at its origins, however. In the early 1970s, there came a schism in the world of skiing. A new generation of athletes looked to buck the traditionalism of standard alpine skiing, and longed for new ways to innovate. What they came up with was freestyle skiing, also called hotdog skiing, also called acrobatic skiing, also called stunt skiing. And it was composed of three elements: moguls, aerials, and ski ballet. Essentially, these innovators would get down the mountain in increasingly more artistic ways, from the pogo tricks of moguls to the vaulting acrobatics of the aerial portion, then finishing with more dance and flatland tricks on the slight incline of the end of the race. It’s baffling that ski ballet never made it into the Olympics, because when freestyle skiing was broken into three distinct events, the other two elements did. In 1988, all three freestyle skiing events were demonstration events. In 1992, moguls were a medal event while aerials and ballet remained demos. By 1996, moguls and aerials were official events and ballet was scrapped entirely. With the exploding popularity of snowboarding (the Winter X Games premiered in 1997), ski ballet’s fate was sealed. Finally, by 2000, the International Ski Federation officially pulled the plug on ski ballet. The sport attempted a rebrand as acroski (pronounced like acrobat, not acrostic), but could never find its way into the Games. If the Twitter response to the unearthing of this fading memory of an event is any indication, however, there may be a viral push to get the event back in the future. And yet, one has to wonder: without the dayglo pageantry and mixtape soundtracks, would ski ballet carry the same cache? In the event that modernity would mar the nostalgia, we’ve always got YouTube. For more on ski ballet from those who pioneered it (including a great discussion of how they made their own soundtracks for their routines), there’s a great short documentary that NBC produced for the Olympics. Erik Helin is a Thrillist contributor.